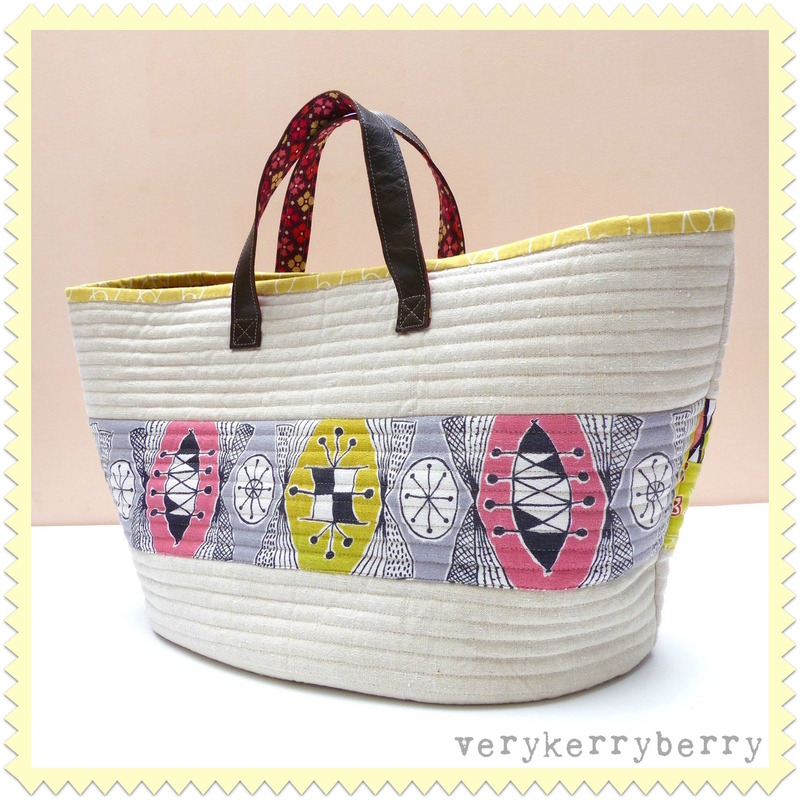 Alexander Henry Tutty Fruity Canvas cotton. 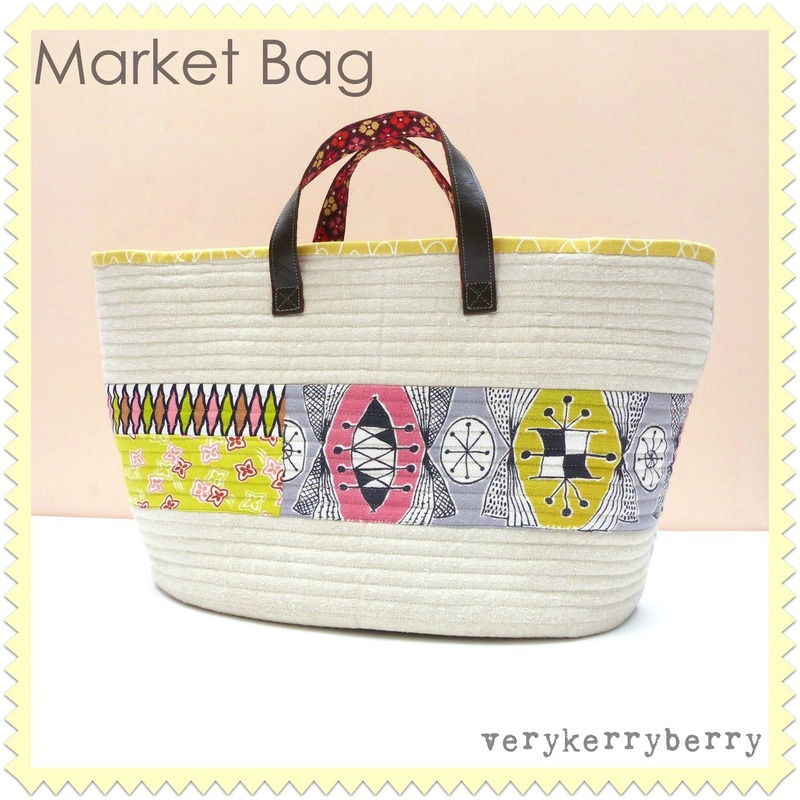 Perfect for bags, cushions and any thing where a slightly heavier weight fabric is called for. 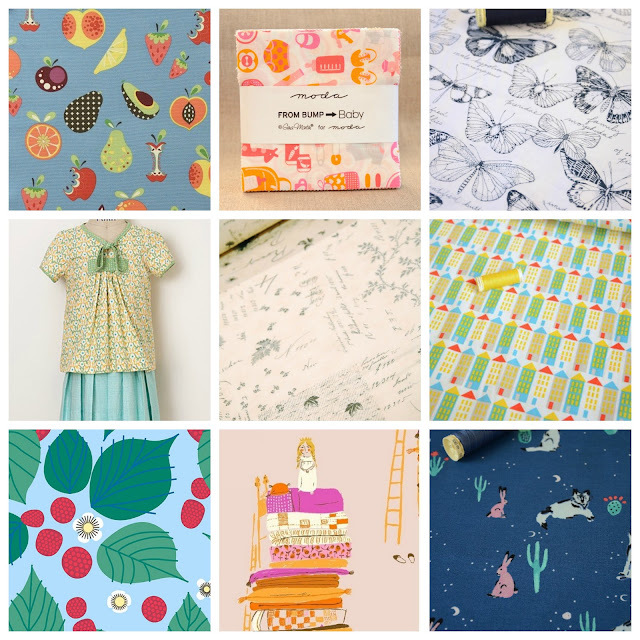 Moda, From Bump to Baby Charmpack, Gina Martin. A fabric precut just waiting to become a new baby quilt! Cloud 9 Organic Fauna Biology by Sarah Watson. Glorious organic cotton for only £9/metre. Oliver+S 2+2 Blouse and Pleasted Skirt Paper Pattern. 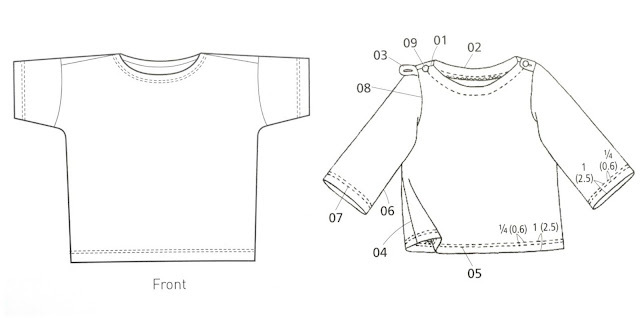 For age range 4-8 years and there are a verity of options included - sleeve length variations etc. Moda, Charcoal on Linen Archive Collage, Atelier by 3 Sisters. Linen is the colour way not the fabric content which is quilting cotton. Lovely low volume print. Cloud 9 Organic Small World Corduroy by Rae Hoekstra. Bargain at only £9/m, just the ticket for children's clothing. Andover, Strawberry Blue Green from The Lovely Hunt by Lizzy House. Also available in pink. This print reminds me of William Morris, it feels like a modern day interpretation. Princess in Pink, Heather Ross for Windham fabrics, Far Far Away. Also available in orange. Cotton+Steel, Animal Spirit Night Blue, Mesa Alexia Abegg. One of my favourite C+S prints, £7.80/m and also available in a lighter mint colour way. This would make a great backing print for a small baby quilt. 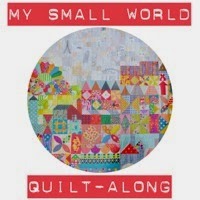 I recently bought a new vintage machine, a lightweight model to take to meet-ups and Modern Quilt Guild meetings. She's an Elna Lotus SP dating from mid to late 1970s and although she comes ready to carry, I thought I would make a bag to keep her in to stop her getting banged about in the car and to keep the dust off whilst in the house. I've been longing to make the Market bag from Anna Graham's Handmade Style book and the dimensions were the perfect fit for the machine and pedal. Otherwise, it was as instructed in the book I used materials from my stash including a long treasured Japanese zip from Ayumi and some fabric vintage scraps. The linen was a carboot sale purchase from a few weeks back and the leather on the handles was from a leather cushion cover bought years ago in a charity shop and last seen in used for a pocket on the Aeroplane bag! I used a mix of By Annies Soft & Stable and Bosal In R Foam Sew-in scraps left over from other projects and zig zagged them like with quilt batting but it collapsed at the join so I added an extra strip over the top during the quilting process and that worked just fine. The Soft and Stable has a slightly nicer feel but that's purely subjective and they both sew easily and add structure. It was my first time sewing leather handles. I added some of the canvas Denyse Schmidt lining fabric to strengthen them and I stitched them using Schmetz leather needle, along stitch and a walking foot. This leather is quite thin so it was straightforward. The straps can take the full weight of the bag but I tend to carry it underneath just to reduce the strain. I'm really pleased with it, a lovely pattern from a very useful book, perfect size for the new-to-me machine and I enjoy seeing those special vintage prints against the linen. Time for a summery vist to sponsor, Plush Addict. 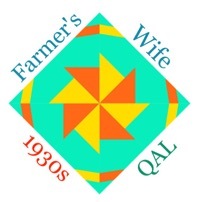 Three themes: quilting, dressmaking, craft - other projects- bags, cushions etc. Alison Glass for Andover fabrics, Chroma Handcrafted Batiks. A modern twist on batiks. This super saturated colourful range is ready for preorder as a bundle or yardage. Bethan Janine for Dashwood Studio: Norrland Main White Metallic. A woodland illustrative theme combines with geometrics and metallics. See the rest of the collection here, including a stunning border print. Laundry Basket Quilts for Andover fabrics: Blue Sky, bundle and yardage. Gorgeous blue/cream and tan traditional prints. I've already ordered a few of these and they are beautiful! Little Darling Cotton Jersey, Swallows on blue. Pretty cotton jersey, 95% cotton/5% elastane. I've already ordered some of this and it's very well behaved for sewing- no rolling! I'm going to make a boat neck t-shirt. Also available in white with blue swallows. Perfect for a Colette Moneta dress too! Colette Moneta Dress. Very popular jersey knit dress pattern. 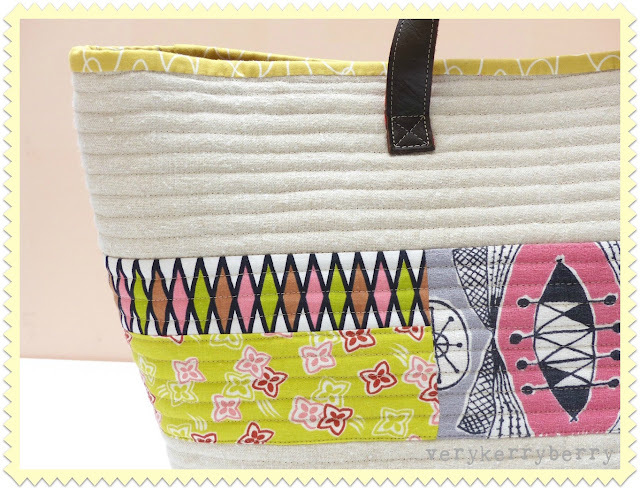 Made by sewing bloggers everywhere! A large range of Colette patterns have just been added to Plush Addicts pattern selection. Colette Sewing Planner. 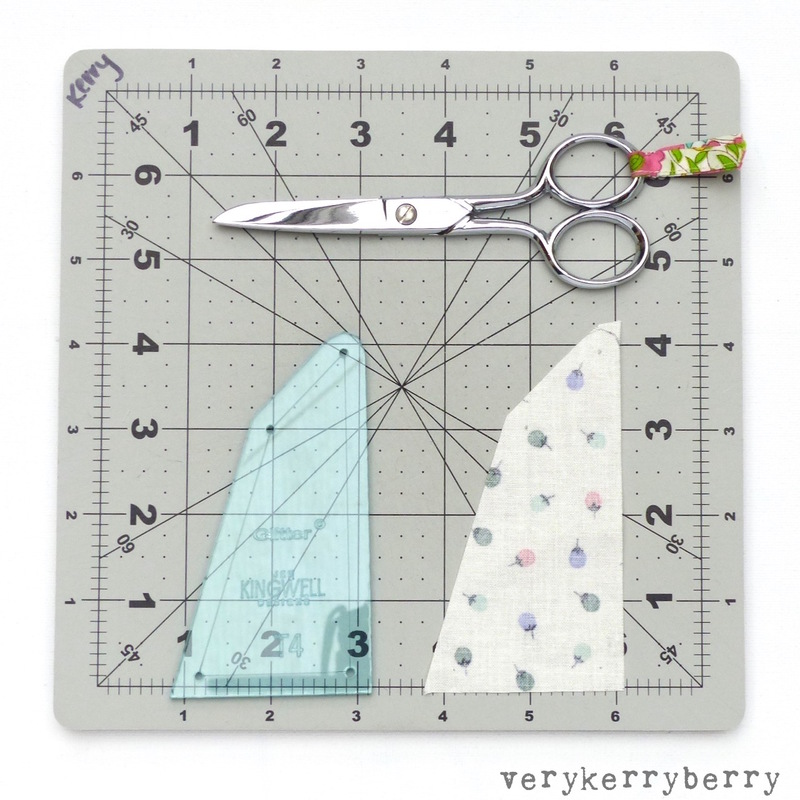 I like this as a gift option, perfect for the stationery addict/dressmaker! Linen look canvas fabric - French Vintage Sewing on Natural. Lovely print, perfect for sewing storage projects like a sewing machine cover or project bag. Yarn dyed gingham. 100%cotton and a woven gingham, rather than printed. 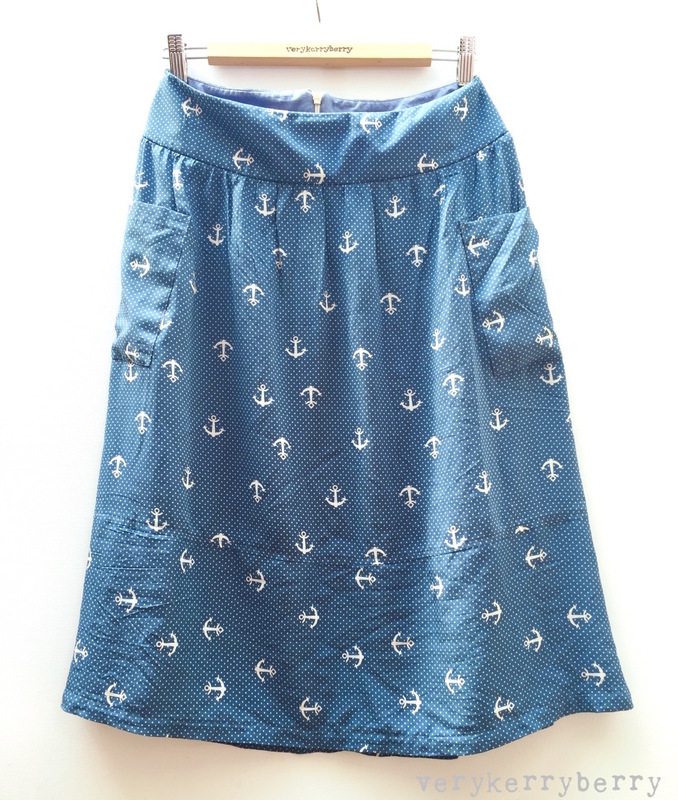 Perfect for table cloths, aprons, school dresses and summer dresses. Other colour options available here. Linen look canvas fabric - Alice in Wonderland. This must be the year of Alice in Wonderland prints! This canvas weight fabric is 140cm wide and 80% cotton/20% polyester. Seamwork digital magazine (run by Colette) come up with two new digital patterns for each issue but it's been a while since I've been tempted to subscribe. 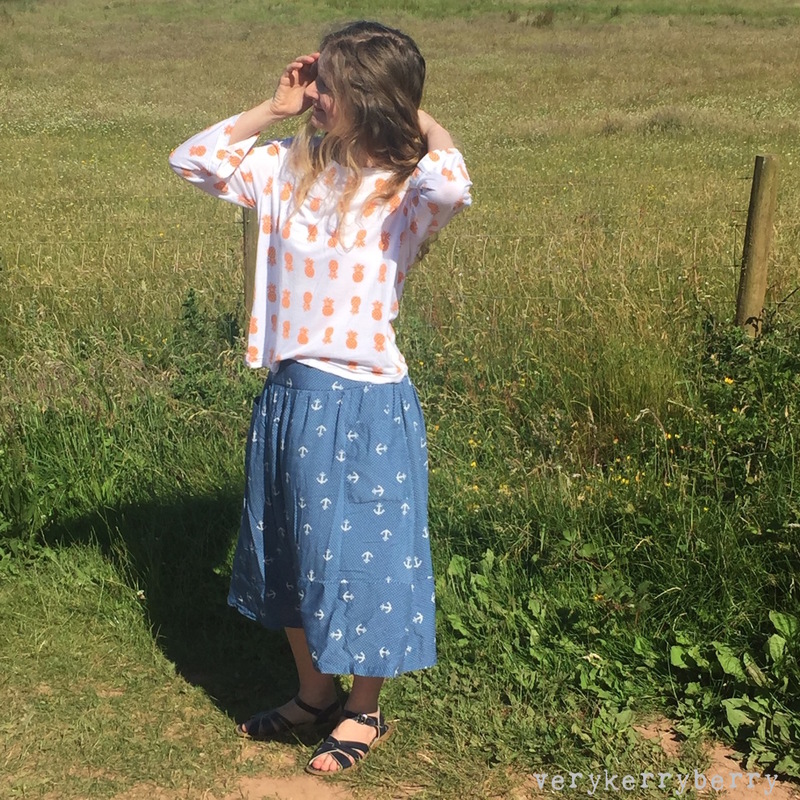 This month, I instantly loved 'Patsy', a modern take on a peasant style skirt with a yoke waistband, gently gathered A-line skirt, patch pockets and contrasting lower section. Membership was also on offer at $3 so I bought, made and wore the skirt in less than a week! 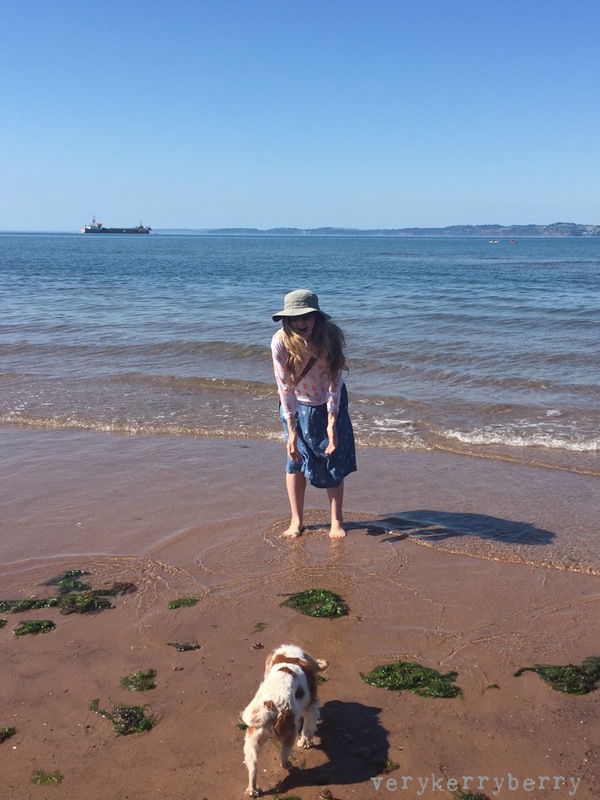 We had a long weekend away booked at a local beach holiday park and the weather forecast was hot so I bought some very floaty lightweight rayon for a lightweight summer skirt that would protect my legs. I made a straight size 4 and I would say the waist measurement comes up generous. I printed sizes 4 and 6 on the pattern layers just in case but the 4 fitted with room and sits about 2.5" above the start of my hip bones. 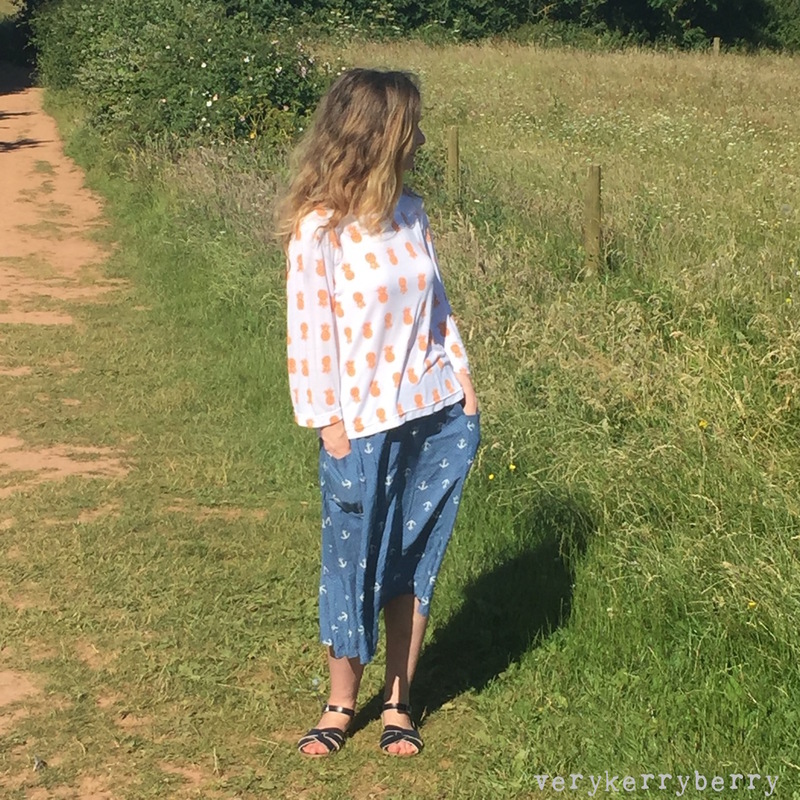 It's an easy style to work out your size as the low waist is the only fitted area and it's easy to print of a few waistbands and make them up in scraps to test before you start cutting the good stuff! The fabric I chose is prone to creasing but it is such a cool breezy skirt to wear in some very hot weather for the UK so I can happily overlook that! 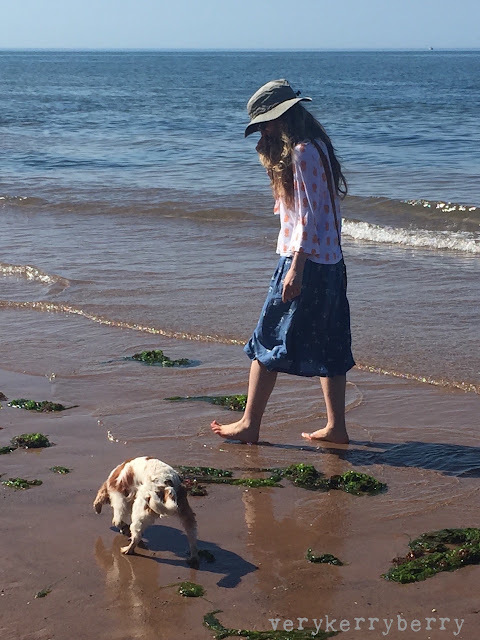 The construction, as with all Seamwork projects, is based on a quick result so I did depart from the instructions and used slightly different methods for the waistband and pockets based on personal preference and a neater finish but all the basics are in the original pattern. 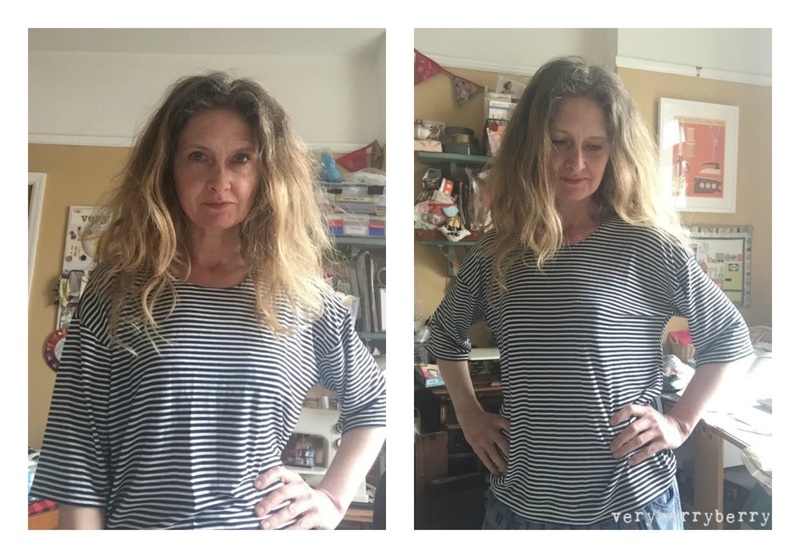 I especially liked the shaped waistband as it's such a comfortable fit on me an waist yoke is very forgiving and more flattering than a narrow, crosscut waistband. The patch pockets are a good size and I liked the placement. It also works really well as a simple short skirt, just omit the bottom section. I'd plan to lengthen the main piece by 2-3" so it's on the knee rather than above. Used Perfect Fuse sheer fusible interfacing on the waist band and doubled it up to create more body but without being too heavy for the outer waistband. Used a heavier chambray fabric for the waistband facing. Added 1" sheer fusible interfacing on the back seams to just beyond the end of the zipper placement. Used a lightweight concealed zip- the zipper teeth are attached to a mesh fabric rather than twill tape, less weight and stress on lightweight fabric. Used ¼" twill tape at the top waistband seam (see the Soho skirt pattern for this technique). Interlined the pocket with Liberty lawn so they didn't distort with use. Following on from the post on how I prepare for hand piecing quilt blocks like the Glitter blocks with acrylic templates, once the pieces are cut out, this is how I organise them. I use a mix of the plastic pockets from old spiral bound Paperchase notebooks and zip pockets. 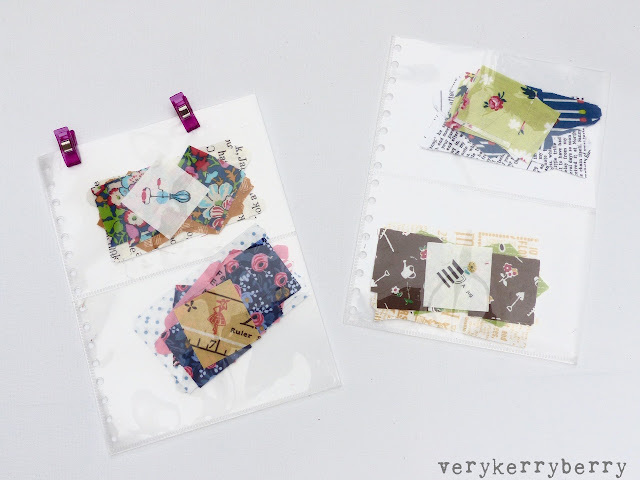 The smallest notebook plastic pockets are perfect for storing the fussy cut centres before they are assigned to a block. They're also good for keeping the acrylic templates together. 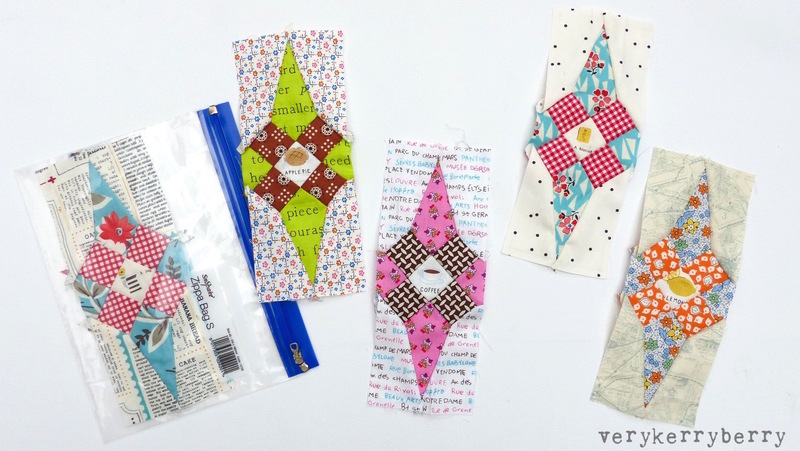 These are A5 pockets recycled from old notebooks and are divided in the centre. Each pocket stores all the pieced for a single block. I stack up the pockets and hold them together with Clover binding clips. This also stops the pieces sliding out. 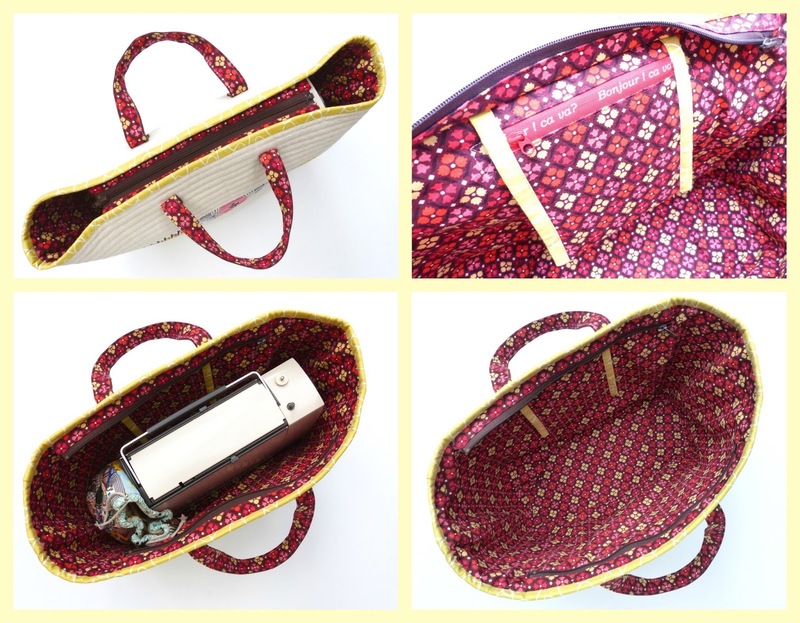 I then use a mini zippa bag to store the clipped pockets and another to store completed blocks. 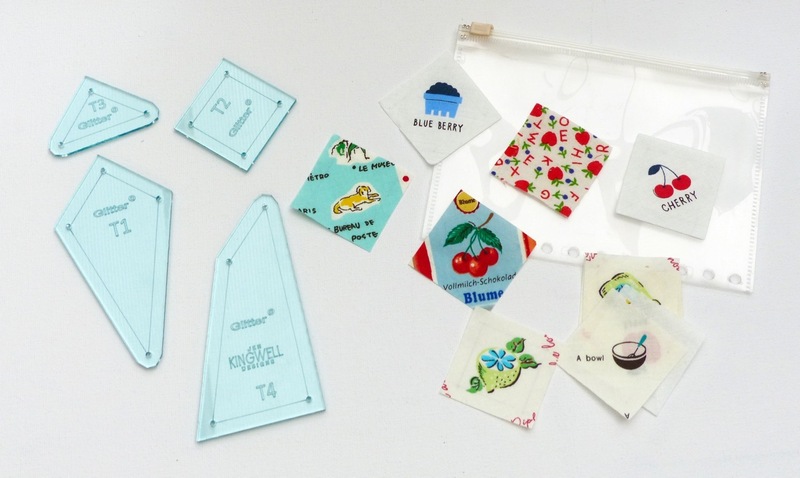 These fit into a larger zippa bag with a mini sewing kit (needle book, needles, a few tiny pins, bobbin of thread and snips) and everything will lie relatively flat at the back of a rucksack ready for travel. This is a travel project for me, for train journeys, holidays and weekends away so progress is slow but now I have an effective preparation method, I always have a few ready to go! 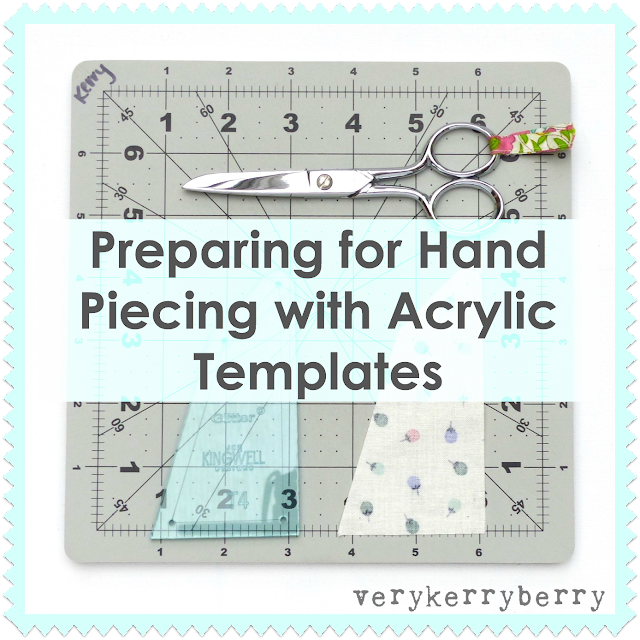 I've found using acrylic templates has sped up my Glitter Block making no end so I thought I'd share how I use them. It is a simple process but I know everyone does things a little differently so this is how I do it, if you have any further tips, comment and share! 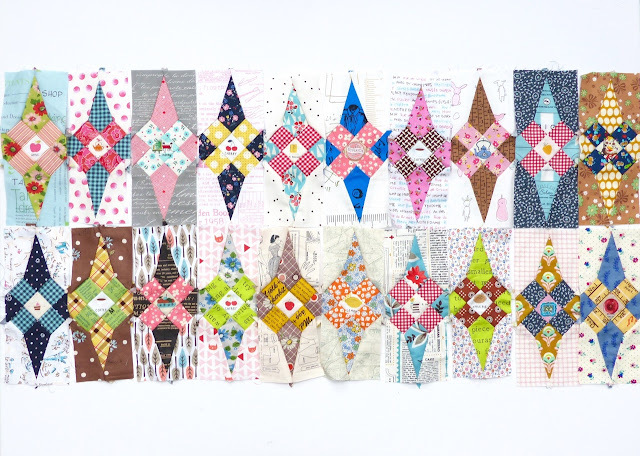 The Glitter block is designed by Jen Kingwell and can be found in her Quilt Lovely book. 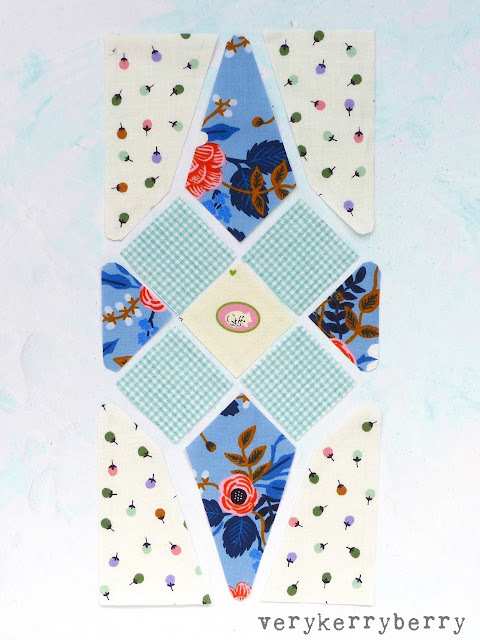 The templates are available from Pretty Little Fabrics and Trims (currently sold out) and also from Jen's Amitie shop in Australia. Starting with the small square as it is the easiest shape to work with, I place the template on the reverse of the fabric and use a Sewline ceramic pencil to place a dot through each of the corner holes- these are ¼" in from the outside edge. These dots act as an anchor if the template slips around at all. I then use a small rotary cutter, 28mm or even 18mm if you find that easier, and cut along the straight edges of the template until the square is cut out. Next, I then use the template to add the seamlines to the reverse of the fabric piece just cut out. 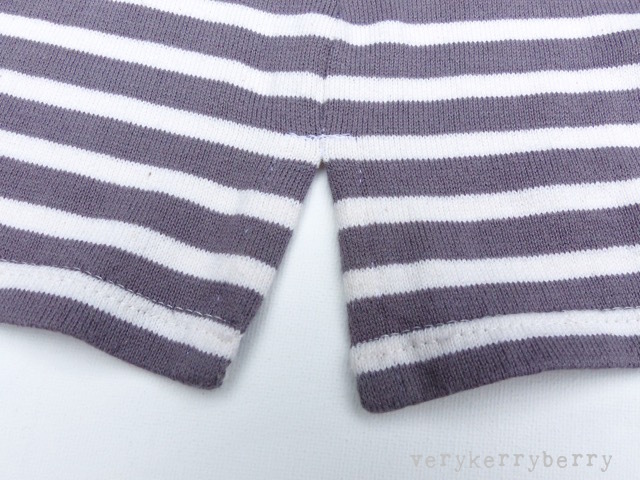 In hand piecing, the pencil lines are added for accuracy so you don;t need to constantly check your ¼" seam allowance. You could just join the dots but as there's a little room in the holes, the dots can be a little out of line. Instead, I use the acrylic template and line up the edge of the shapen so it almost touches with the ¼" line on the template. This allows for the space your pencil line will take up. Drawn the line extending beyond the dots. Repeat for each side until all the lines are drawn. For the shapes with angles under 90 degrees which which are shaped on the templates to avoid dog ears and bulk, I draw around these points, rotary cut the longer straight edges and then use small scissors to trim around the points. The templates are flipped over to provide the mirror image shapes on this block. I am using a fussy cut centre for each of my blocks and I've found it much quicker to spend a bit of time with suitable fabrics and cut multiple centre squares; I match up the coordinating fabrics with each centre another time. 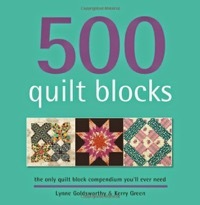 As with all quilt blocks. I think about contrast, scale and variety when I choose the fabrics and a little story telling too around the fussy cut centre. Here's the block, prepped and ready to be pieced. I'll share how I organise the pre-cut blocks for travel tomorrow! I'm trying out a different presentaion for my sponsor post visits, I'm trialling the paid version of Picmonkey and enjoying fiddling with the photo options! So, on this month's visit to Village Haberdashery I'm showcasing three separate options depending on your sewing preference: dressmaking, quilting and smaller projects (bags, purses, cushion). 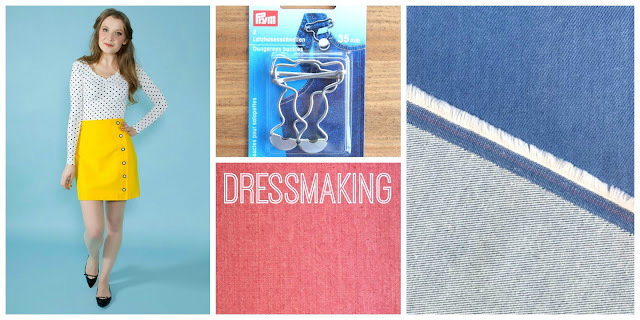 If you're anything like me, you'll want to sew all the things! Cotton Denim Washed Pink. 100% denim cotton in a glorious colour, great for a summer Cleo dress (pattern out of stock at VH but available at Tilly's). Cotton Spandex light Blue Denim, 2% spandex so suitable for either stretch jeans or something where a little wiggle room is appreciated e.g. Straight style skirt like the Arielle. Matching Kona selection for the Goldilocks collection. Perfect co-ordiantion or a very happy stand-alone stack for your stash! Around the Block Canvas- Block Blooms in Navy. On offer at 50% off, stunning print by Heather Moore of Skinny LaMinx for Cloud9, organic cotton canvas weight. Metal Key Fobs. These were so hard to get hold of at one time in the UK, perfect for making your own fobs out of 1.25" webbing. You've most likely seen TNT or 'tried and true' on dressmaking blogs and Instagram. 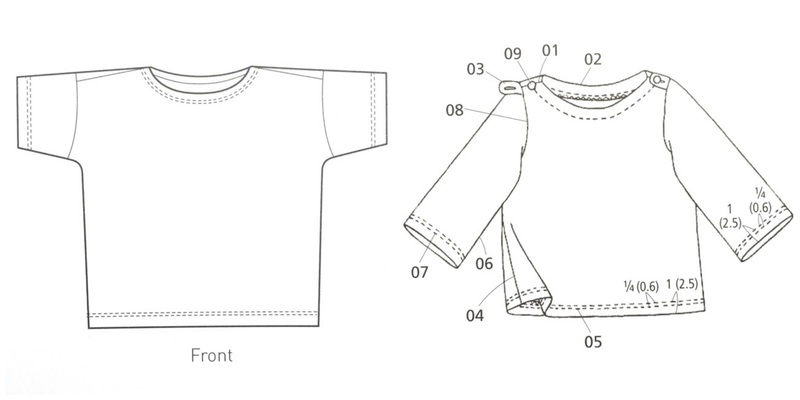 There's a helpful account of what it means here, although I feel on the second making (rather than the fifth in the article) this garment pattern becomes a TNT in my sewing domain. 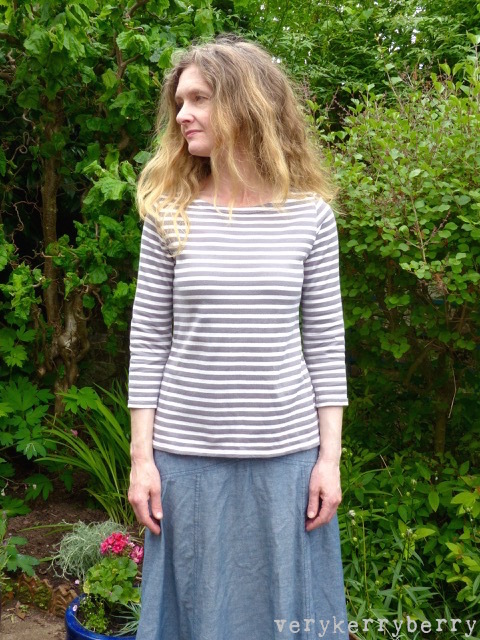 My previous version of the Frankie top can be seen here. It fits well and I wear it a lot on days when it is neither hot nor cold, so that's many days in the UK! My adjustments to the original patterns (taking in the sides little and adding splits to the hem) can be seen in the first Frankie post. 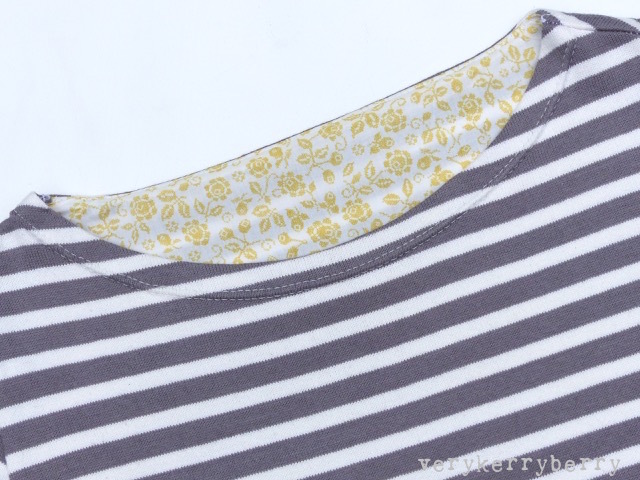 I used Liberty lawn for the back neck facing. The Frankie pattern can be found at Tessuti as a download here. On this version, I did a slight adjustment at the back and shoulder to allow for a little roundedness and to stop the front neck rising a little in wear, and I also dropped the centre front of the neck by ¼" so this one fits like a dream. Both versions are made with a wonderful Japanese Kiyohara knit which is now sold out at Eternal Maker, but I have found it (and bought some more) from Simply Solids in navy and rose red. It is a narrow fabric (90cm) so you do need to check the length accordingly, I squeeze this one out of 1.25m and it was tight. It is heavier than a standard jersey, 100% cotton and washes brilliantly well. A tale of two t-shirts, one worked, the other did not. 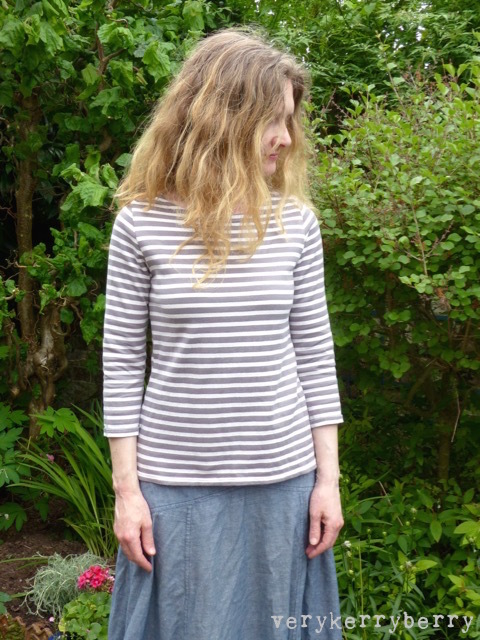 I used a drapey narrow striped viscose (used here on a Sew Over It Molly top) for both. On the surface their line drawings didn't look so different, but it was a lesson in which style lines and silhouettes that suit me, something that I'm still learning and I know it's the same for many of you who sew your own clothes. It just looked oversized, rather than drapey. There's a lot of volume on the upper part of this top, across the shoulders and upper bust which is probably the smallest part of me. When I looked again at the line drawing, I could see the slight carrot shape as the side seams narrow towards the hem. 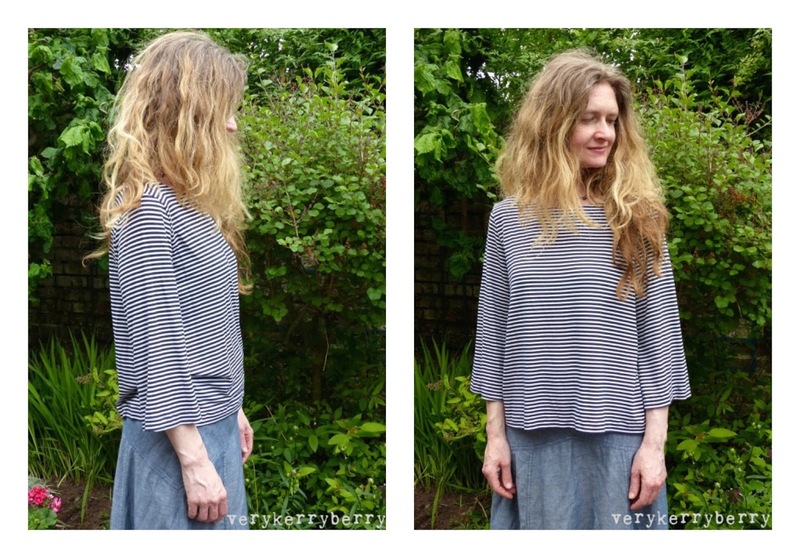 For someone with wider shoulders and maybe a bigger bust, I can imagine it working well but I knew it didn't suit me so I got my scissors out and cut the front and back for the sleeves of the second top and the arms for the neckline facing and got sewing on top two. Ahh, that's better. I've already worn this top several times. I love the floaty hems and the more fitted top. A lesson in knowing what suits you.